As you know it was CrashingRed’s 1st Birthday yesterday. To celebrate we went for lunch in Manly. However, thanks to the wonderful Sydney weather recently, it started raining suddenly and we had to return home. As you know, a white dress is not something you want to walk around in when you’re saturated. Anyways, later the same day we made a second attempt to have our special celebrations and went to our favorite restaurant lately, Manly Pavilion for dinner. Even though it was a bit late to take photos I insisted (poor Joseph) and here is the result. Keep in mind, it’s my second outfit! I put a lot of effort in my first look – the one that got drenched by the sudden rain so I didn’t feel like spending another hour getting ready a second time. Instead I wore what caught my attention first, namely: basic black shorts (also here), scoop neck silk top and suede booties. Adding a gold sequinned jacket to the look made all the difference. 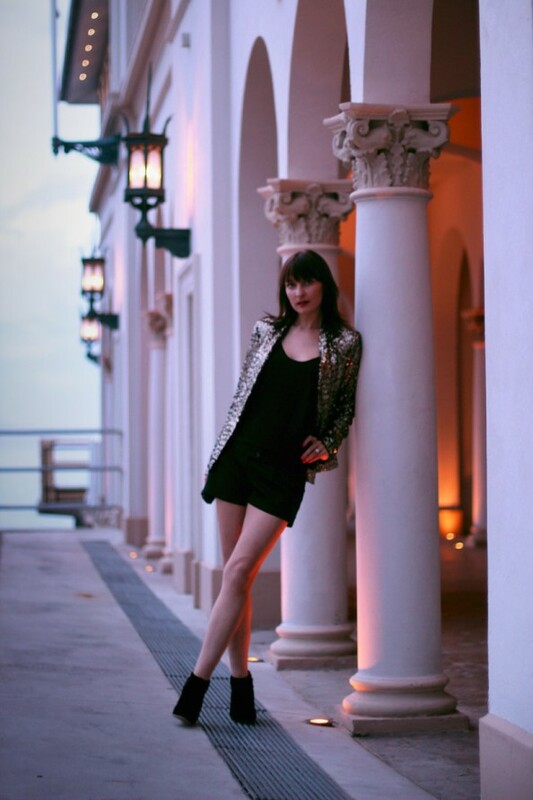 Seriously, this Zara blazer (also worn here) is fantastic for putting great evening looks together with minimal effort. p.s. To celebrate CrashingRed’s 1st Birthday with you my dear readers, I’m giving away something wonderful. Check it out here if you haven’t already. WOow AND these sequins better shine § dazzle in this dark(licious) § uncluttered Ocean I must say (§ widely approve) Here Dear Maria (“Kind aesthete’s conspicuous nod of approval”) ! fabulous outfit, darling! You wear the blazer as a keypiece because the rest of the outfit is black, which I really like. The blazer is so awesome. 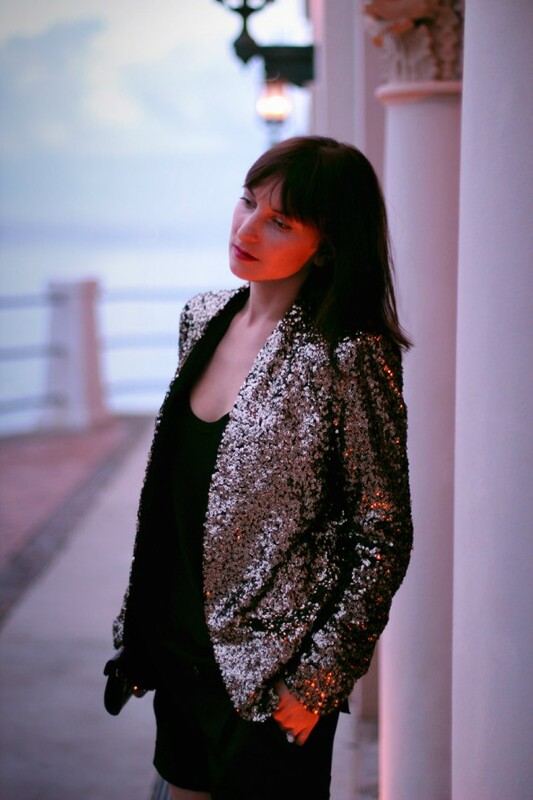 I’m in love with that blazer, I love sequins! Gorgeous blazer! i love the outfit!!!!! I awarded you with the “Best Fashionista”-Award: CLICK! Happy Belated Birthday to CrashingRed.com!!! Hope this will be the first of many to come! Thank you for being such a n inspiration to so many people around the world. OMG! I WANT your sequined blazer!! Oh how I love your blazer…. I don’t know how long I can resist buying one!! Love it paired with black!